Today ArtPrize unveiled its 2012 commemorative poster during an event at LaFontsee Galleries. The design takes inspiration from the Op Art tradition. Kinda messes with your vision, doesn't it? It's supposed to. 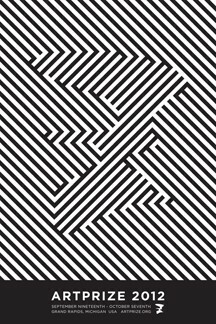 This is a graphic, pattern-driven style, known for its ability to play with the eye, dancing the line between two and three dimensions. It make viewers look, look again, and stretch their minds to understand what they see. The same senses of tension, fluidity, and changing perceptions are what make the ArtPrize experience so challenging and rewarding. While every ArtPrize event stands apart through the work of thousands of artists, the design direction of ArtPrize serves as an additional graphical identifier to distinguish each annual competition. This design will be translated into event signage, apparel, merchandise, among other applications. "ArtPrize can do very little to direct the broader conversation, that's up to the artists and the audience. What we can do is establish what a conversation 'looks' like,” said Todd Herring, marketing director at ArtPrize. "Each line on this poster can visually represent the direction of our thoughts or opinions. We can go a great distance without intersecting another line, but inevitably we do, and when that happens is when a conversation starts. This is when ArtPrize happens." The 2012 commemorative poster was created by Square One Design. It will be available starting May 9 at the JW Marriott Hotel in Grand Rapids.